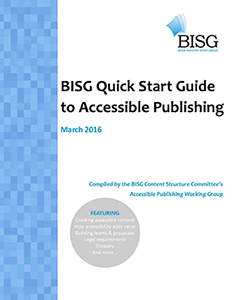 Last week the Book Industry Study Group (BISG) launched its Quick Start Guide to Accessible Publishing, providing a comprehensive guide to the essentials of creating accessible ebooks. The guide is available as a free download from the BISG site in, not surprisingly, a highly accessible EPUB as well as, unfortunately, an untagged, and hence largely inaccessible, PDF. It is, however, full of useful information and tips on how to improve the accessibility of your EPUB publications. Its technical chapters and resources pages are clearly aimed at developers and production staff, but the guide also includes information for executives and management on topics such as the business case for accessible publishing and the relevant existing and emerging statutory and other legal requirements in various countries. Topics covered/chapter titles include why accessibility is important, how to create accessible content, how to set up internal teams and processes, developing a baseline for accessibility, overview of legal requirements and (appendix D) code samples. All in all, the BISG guide is an excellent resource and is certainly, as it states itself, a great place to start. However, it is just that­­—a starting place. For in-depth coverage of accessible EPUB production, editing and testing techniques beyond the necessarily limited scope of any quick start guide, please check out our Accessible ebooks from InDesign course.